L'ultimo post dell'anno non poteva che essere una nail art, l'ultima del 2015. 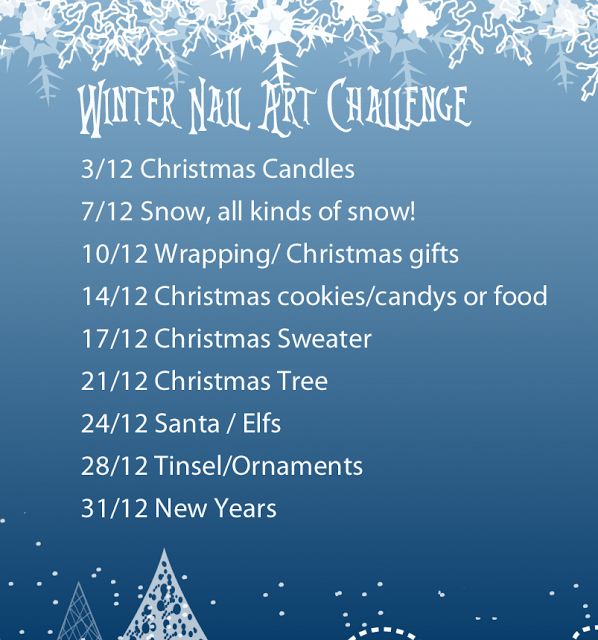 Con questa nail art si conclude anche il Winter Nail Art Challenge che mi ha tenuto compagnia in questo mese, e il tema non poteva che essere Capodanno. Per me Capodanno vuole dire abbinamento oro e nero e soprattutto glitter! Invece che usare i soliti smalti glitter ho scelto Pupa Golden Plumage della collezione natalizia 2015, te lo avevo mostrato appena comprato qui, un flitter oro su base trasparente. Appena ho comprato questo smalto ho subito deciso che sarebbe stato la base per una manicure delle feste, ed eccolo oggi agghindato per festeggiare il nuovo anno! 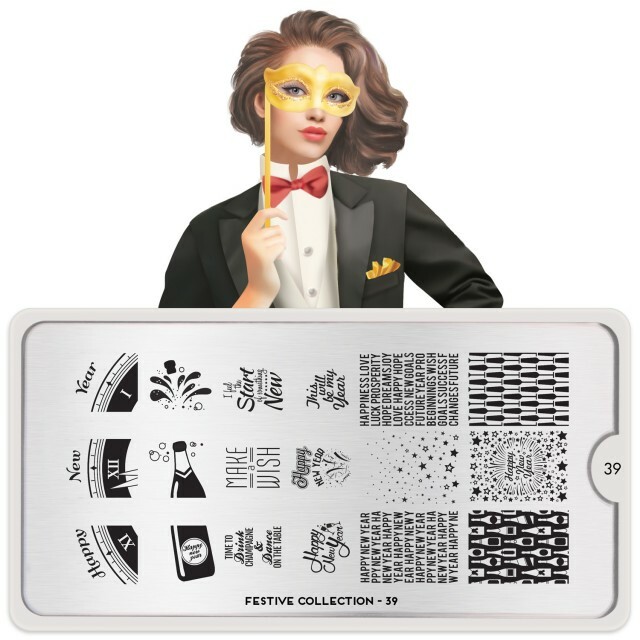 Per lo stamping ho usato il mio nuovo disco MoYou London Festive Collection 39. Con lo smalto speciale nero ho stampato i primi tre disegni su indice, medio e anulare, sul mignolo ho usato la scritta più piccola del disco per ripetere l'augurio. Ho applicato il top coat in doppio strato per rendere liscia ed omogenea la superficie delle unghie. Felice 2016 e a domani per scoprire la mia nail art di inizio anno! The last post of the year must be a nail art, last nail art of 2015. 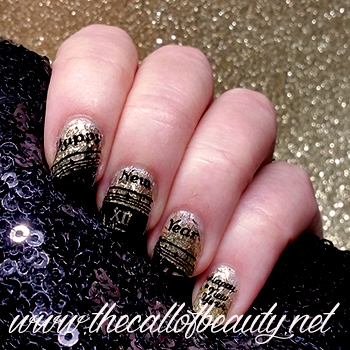 This nail art is the last of the Winter Nail Art Challenge and the prompt was New Year's Eve. To me New Year's Eve means gold and black and glitter everywhere! Instead that a regular glitter polish I used Pupa Golden Plumage from Christmas 2015 collection, I show you this beauty here, it is a gold flitter in clear base. When I bought this polish I decided it would have been my holiday manicure base and you can see it today to celebrate the new year! For the nail stamping I used my MoYou London Festive Collection 39 plate. I stamped with the black polish the first three designs on index, middle and ringfinger. On my pinky I used the tiny words. I applyed two layers of top coat to level the nail surface. 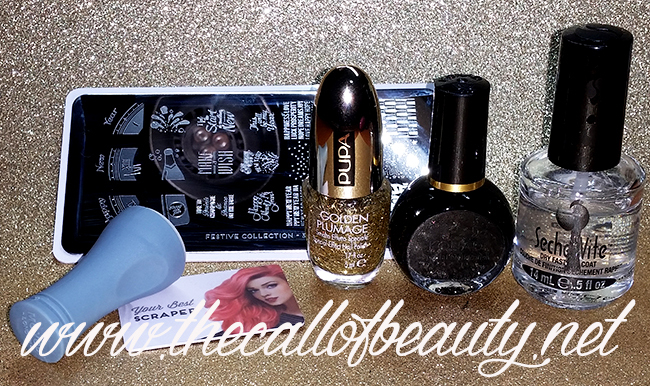 Happy 2016 and see you tomorrow to check out my first nail art of the year! Really nice gold and black manicure to celebrate the new years with! Tonight I am doing a silver/grey super glittery mani! Thank you Helena, I had so much fun joining you and other girls in this challenge! Hope we can do more! Thanks a lot Colourman, I really appreciate your lovely comments! I wait for you in my upcoming first 2016 post! Ya I agree gold and glitter reminds me of new years too :) I love how this turned out! Happy new year Sara! Happy 2016 to you too!!!!! Grazie Barbara! E' bellissimo incontrare nuove amiche tramite i nostri blog e la nostra passione in comune! Così mi piace tantissimo l'utilizzo dello smalto plumage. Da solo è bello ma...è come se mancasse qualcosa. Così è davvero rivalutato!